STOCKHOLM (Reuters) - Swedbank's board backed chief executive Birgitte Bonnesen on Friday as some investors questioned a heavily redacted external report into allegations of money laundering through its Baltic branches. Forensic Risk Alliance's (FRA) widely-anticipated report, which has large sections blacked out, said it had identified a number of previously named clients that a media report said should have raised red-flags at Swedbank over potential money-laundering risks. Several banks have been dragged into a scandal at Danske Bank, whose Estonian branch was used for 200 billion euros (172.3 billion pounds) of suspicious payments between 2007 and 2015, knocking their shares and fuelling investor fears. The Swedbank report came as Norway's Financial Supervisory Authority (FSA) said that several banks operating in the country, which it did not name, had made insufficient anti-money laundering risk assessments last year. Swedbank's CEO Bonnesen said the FRA's report showed that bank's systems and processes had worked, but its shares, which have lost around 15 percent since the allegations were published in February, dropped by 1 percent. "The important thing is that we feel secure in the way we have worked with this issue in the relation to the possible 50 clients," Bonnesen told Reuters. Swedbank Chairman Lars Idermark said the board continued to back Bonnesen, who was chief audit executive at Swedbank between 2009 and 2011, a job which included overseeing the bank's anti-money laundering policy. Bonnesen then moved on to run the lender's Baltic operations until 2014. AMF Pension, Swedbank's fifth largest shareholder with 4.8 percent of shares, said it had expected more and that more information was needed to restore confidence in the bank. "We will therefore continue to work for more transparency and openness, thereby increasing confidence in the bank, and for answering remaining question," AMF said in a statement. 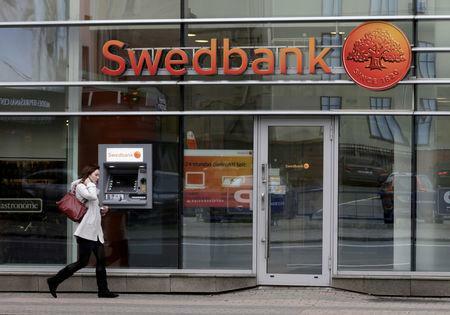 Alecta, Swedbank's third-largest investor with close to 5 percent of its shares, called for more clarity and said a more thorough evaluation is needed to restore trust in the bank. "Neither the report presented ... nor the proposed continuation live up to our expectations," its said. The report was also criticised by Bill Browder, an investor who campaigns to expose corruption and has filed a criminal complaint with Swedish authorities over Swedbank's alleged link to money laundering through the Baltics. "This doesn't give us any clearer picture how big the money laundering problem was, who knew about it inside Swedbank, when they knew it and what they did about it," Browder said. FRA said Swedbank had searched its own systems for its report and that it had not been provided with an internal report on anti-money laundering procedures. Swedish Television reported allegations last month that 50 clients transferred at least 40 billion Swedish crowns (3.28 billion pounds) between Baltics accounts at Swedbank and Danske Bank between 2007 and 2015. Swedbank said on Friday it would continue to strengthen its anti money-laundering capabilities, adding that it had flagged some 3,800 suspicious transactions to local authorities in the Baltics in 2017 and 2018, while business dealings with 886 non-resident customers had been terminated in the region. Sweden's financial watchdog said the FRA report would be included in its probe and that it could not comment further on the matter, while Swedbank's board said it would conduct a deeper review in cooperation with "relevant authorities", without giving details. And the bank's two biggest shareholder, the Savings Banks' Owners Association which has a 10.5 percent stake, and Folksam, which has an about 7 percent stake, expressed confidence in the board and the CEO after seeing the report. "The bank has assured us that they have complied with applicable regulations and reported suspicious transactions to authorities in all countries concerned," Lennart Haglund, chairman of association and head of Swedbank's nomination committee, said in a statement. Investment bank Keefe, Bruyette & Woods said in a note to clients that it was positive that no "smoking gun" was found in the initial investigation but that "considerable further work will be required to clarify the situation comprehensively."